A 3,200-year-old sample of cheese has been found in a tomb in Egypt and, according to a study in the journal Analytical Chemistry, it’s probably the most ancient solid cheese ever discovered. That got us thinking about the topic of shelf life here at Dairysafe. There are use-by dates and best-before dates, but what does it all mean? Standard 1.2.5 of the Food Standards Code, ‘Information requirements – date marking of food for sale’, outlines the legal requirements for date marking of food for sale, including ‘use by’ and ‘best before’ dates. Date marking provides consumers with a guide to the shelf life of a food and is based on either quality attributes of the food or health and safety considerations. The date mark indicates the length of time a food should keep before it begins to deteriorate or, in some cases, before the food becomes less nutritious or unsafe. In Australia and New Zealand, there are two main types of date marking, these are ‘best-before’ and ‘use-by’. The food business attaching the label is responsible for deciding whether a ‘use-by’ date or a ‘best-before’ date is needed. This will depend on whether the foods need to be eaten within a certain time because of health or safety reasons. For the dairy industry, ‘use-by’ dates are most relevant. A ‘best-before’ date is the last date on which you can expect a food to retain all of its quality attributes, provided it has been stored according to any stated storage conditions and the package is unopened. Quality attributes include things such as colour, taste, texture, and flavour, as well as any specific qualities for which you make express or implied claims, such as the freshness of the food. A food that has passed its ‘best-before’ date may still be perfectly safe to eat, but its quality may have diminished. A ‘use-by’ date is the last date on which the food may be eaten safely, provided it has been stored according to any stated storage conditions and the package is unopened. After this date, the food should not be eaten for health and safety reasons. The ‘use-by’ date is restricted to foods which need to be eaten within a certain time because of health and safety reasons. It’s important to note, the Food Standards Code specifies a food must not be sold after its use-by date. 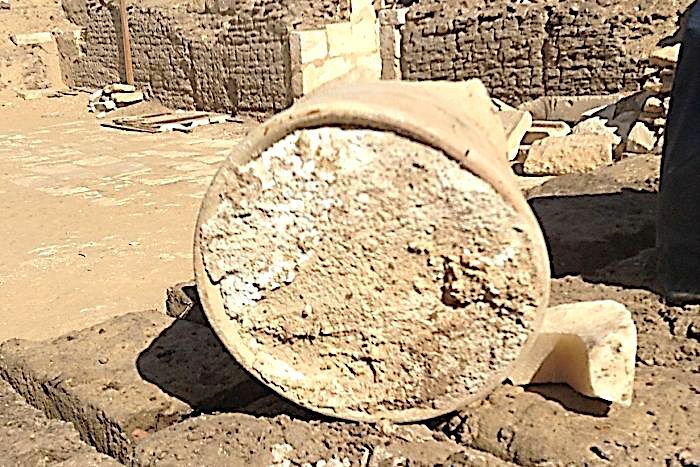 We think the 3,200-year-old cheese found in Egypt is well past its use-by date. We wonder what shelf life testing would now reveal in the ancient archaeological solid residue! The 3200 year old cheese. Image courtesy University of Catania and Cairo University.